The Color Run. The Happiest 5K on the Planet? Probably not. If you remember, my goal was just to enjoy this race. Goal complete! I did enjoy this race. I started met up with my cousin and a few of her friends. One of the girls was totally up for walking so I had a buddy. My cousin had a goal of running the entire race and was successful! YAY KERI! I ran into two great friends who were also running. It was a PERFECT day – weather-wise. Anyone who lives in the Midwest knows the extreme drought we have. I heard on the news today that 25 of28 days of July have been 90+ degrees. We had a lovely rain shower Friday afternoon that cooled things off. Bottom line – it was the perfect day for a race. Pre-race. All pretty and white! Now, let’s talk about the organization of the race. We were supposed to start at 8 a.m. We didn’t start moving toward the start line until 8:30, starting at about 9. The path was pretty typical for raced at White River State Park. However, there were too many people for the final leg of the race that used a smaller sidewalk. Recommendation – better organize the start. 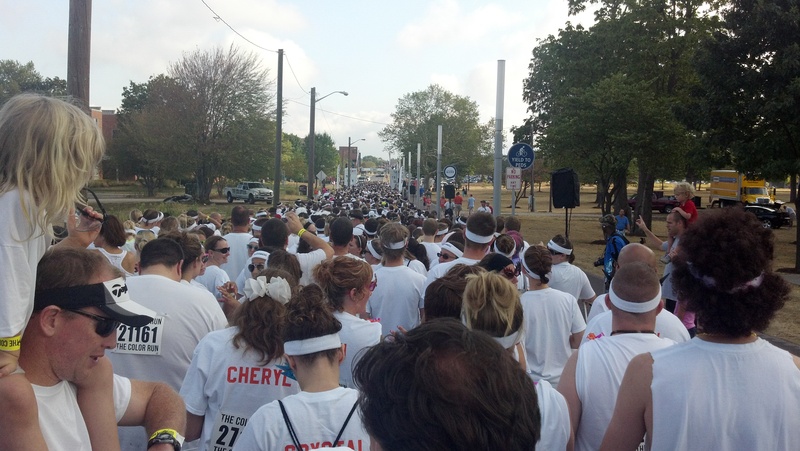 Maybe use corrals – not necessarily for time but for number of people to start each wave. Our first view of the starting line. Let’s chat about this color stuff. The color itself is a powder and was sprayed with large squeeze bottles (think ketchup/mustard plastic bottle). On the website, it stated if you want a ton of color run on the outside, less color run down the middle. The first color was orange and I went right down the middle – I received NO color. The next color area – yellow – was a bit more color as I was on the outside. The next 3 color stops – blue, pink, purple – we waiting in a line to get sprayed with color. Still nothing like the advertisements, I was disappointed. You were also given a color packet to use at the end of the race at the celebration. Cool idea – yes. However, you had to run with it. There was also a list of things to bring – towel, change of clothes, sunglasses, sunscreen, etc., but no bag check. Maybe these could be handed out as you cross the finish line. And a bag check would be nice. Overall, a good day! I had a good time, good company and a fun event. Given the cost of the race, I doubt I will do it again. 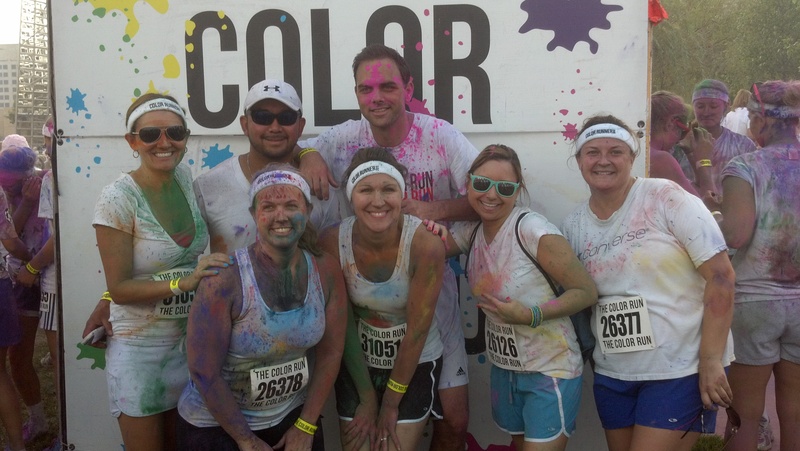 Have you run The Color Run? Did you have a good time? What other type of fun runs are out there? 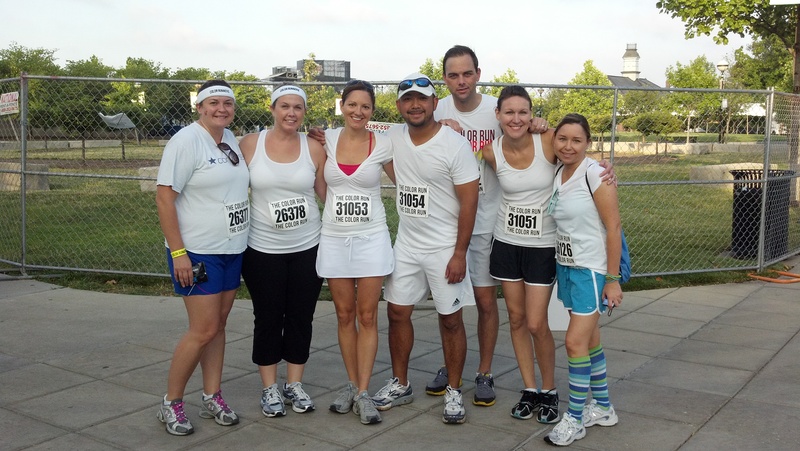 This entry was posted in July 2012 and tagged 5K Race, The Color Run by Pam. Bookmark the permalink.